The Report titled “Three Decades of NSTMIS Scheme – 1985-2015: Research Summaries” released by NSTMIS at DST offers a preview of the projects carried out under its umbrella over the last 30 years. These projects funded by NSTMIS have covered crucial areas of science, technology, and innovation (STI) including R&D in S&T, development of databases, creation, and development of manpower resources. 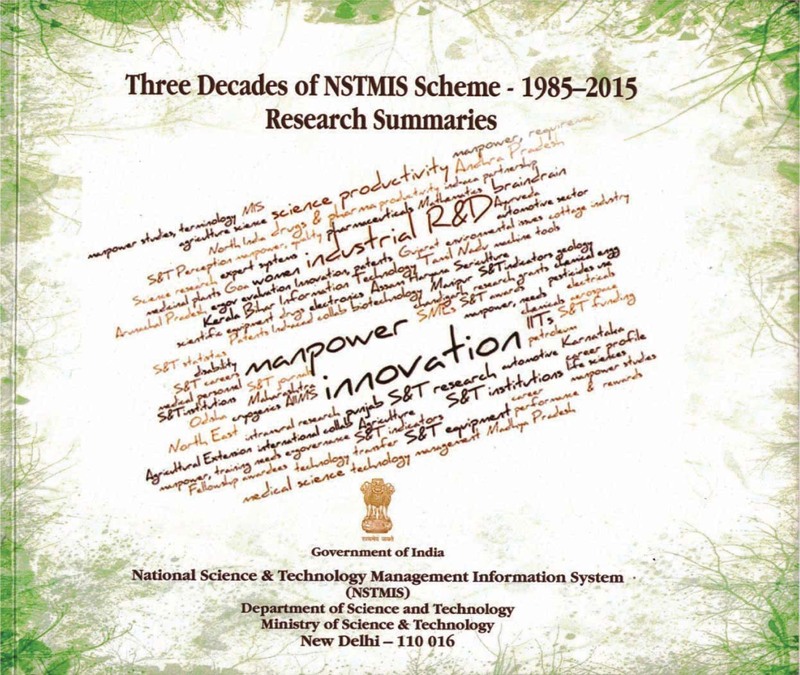 Three Decades of NSTMIS Scheme – 1985-2015: Research Summaries, by National Science and Technology Management Information System (NSTMIS), Department of Science and Technology (DST), Government of India, March 2015. Downloadable from http://digitalrepository-nstmis-dst.org. The National Science and Technology Management Information System (NSTMIS), a division of DST, recently published a summary of the research schemes sanctioned over the last three decades, 1985-2015. NSTMIS has been building the information base on a continuous basis on resources devoted to scientific and technological activities for policy planning in India. The report presents a summary of 175 projects for the span of 30 years. Database development on different areas of S&T has appeared most popular projects of NSTMIS. Another significant focus of the projects has been on industrial R&D. The mapping of scientific and technological (S&T) activities in different areas has also been carried out. Significant emphasis has been given in the areas of innovation which has emerged as the key driver of the economy. Healthcare remains a priority of S&T and the same is evident from the number of projects carried under NSTMIS. The requirement of manpower, career profiling and placements have also remained important projects. The project summaries give a clear picture that most of the Projects during this duration have taken place in the area of development of databases including the development of scientific directories. The projects on the development of databases have ranged from the mapping of manpower development for R&D, R&D institutes, extramural projects in Ayurveda, medical and paramedical subjects. Projects in the area of innovation appear to be the next common topic. The projects on the mapping of innovation activities have occurred in the areas of agriculture, biotechnology, science, and technology, identifying innovation indicators and forms of innovation activities. It may be observed that in the thirty years span of time healthcare including a focus on pharmaceuticals have been significant. The year 2010 observed a project on database management in Ayurveda, 2009 had a project on animal diseases and global database development on Malaria. The year 2006 had a project on the development of a database on the homeopathic system. The year 2004 had a project on the development of a database on traditional systems of medicines which involved metals and minerals. The year 2003 had a project on the development of a directory of Indian research on HIV-AIDS, and in the year 1995, a project developed a compendium of health and related statistics. The pharmaceutical sector received equal attention as the year 2009 had a project to study foreign collaborations of drug and pharma industry, the year 2008 had a project on identifying bottlenecks in industry, academia and institution linkage in the pharmaceutical sector. 2006 had a project on Pharmaceutical education and practicing pharmacist information system. 2004 had a project to identify the quality of manpower in drug and chemical industry. Career profiling and placements have received a lot of emphasis on the projects throughout this time span in India. This career profiling has spanned from the postgraduate and PhD students and the recipients of JRF in S&T disciplines. Equal emphasis has been laid on development of human resources (2000) and identifying workforce requirement (1999, 2013), and S&T manpower engaged in R&D (1999). Interestingly we observed a change in trend in project themes from brain drain (1987, 1992 1996 1999, 2002) to brain gain (2009, 2012). The liberalization process has explained this change in trend. The report also captures the limited projects’ emphasis laid on women in science. The year 1995 carried out a project on occupational choices and occupational patterns on women in S&T. The years 1992 and 2002 each had a project to study the participation of women in engineering courses; the year 1999 had a project on analyzing the career profile of women PhD holders and women S&T manpower engaged in R&D activities; the year 1998 a project examined the status and growth of women graduates in agriculture; the year 1997 had a project to investigate the status of women having completed postgraduate education. In this report, a year stands for the year of completion of that particular project. We can observe that the projects carried under NSTMIS banner have covered diverse aspects of science and technology ranging from innovations, R&D in the healthcare sector, use of information technology in academia/ industries, to creation, development, and assessment of manpower in these areas. In this report, the central institutions stand very prominently in terms of successful completion of the NSTMIS-supported research projects. The report also helps us to understand the functioning of the NSTMIS as a national nodal agency for reporting relevant S&T data to the global indicators maintained by the UNESCO Institute for Statistics. The report is also beneficial for the budding researchers interested in the advancement of STI and scientometric research.